Do You Know Barrister Hasnain Mirza? Barrister Hasnain Mirza is upcoming face in Sindh political system. 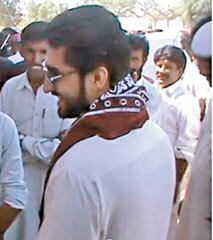 He is son of former Sindh Minister, Zulfiqar Ali Mirza. He is ready to join politics and he will stand on vacant seat of Badin which has been vacant after Zulfiqar Mirza’s resign. Hasnain Mirza is lawyer by profession and he has good support in Badin area due to his family background. It’s too early to say that he would be success or not but as son of two giant political personalities of Sindh, he can also get massive coverage. However PPP supporters are ready to give him every support and whatever is required to make him a famous politician.